Basket Trader is a standalone app that lets you open, close and monitor multiple positions by grouping them together as a basket. Select one (or multiple) currency pair/CFD products and specify the lot size and direction of the trade. The app displays relevant account information such as account number, equity and available margin. You can track the profit and loss of each basket with the option to attach a stop loss and take profit. Close your basket trade quickly with a single click. *CFD Note: The amount requested in the LotSize field takes into account the minimum contract size for the particular instrument. For example, as the minimum contract size for Silver (XAGUSD) is 50, entering “2” in the LotSize field will result in a trade size of 100 opening. 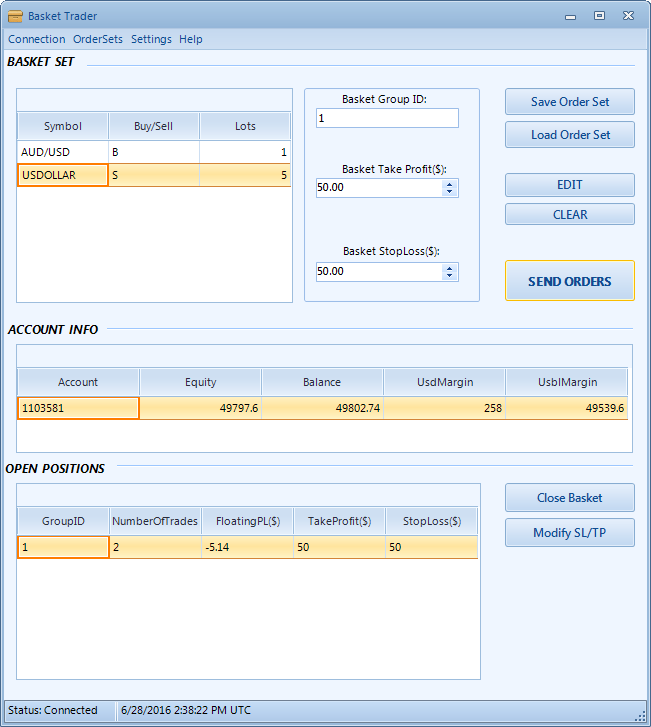 Basket Set: Construct your basket set, assign take profits/stop losses as well as send orders. Account Info: Monitor your current account information: your account number, account equity and balance, and Used/Usable Margin. *Note: P/L is in the base currency of the account.